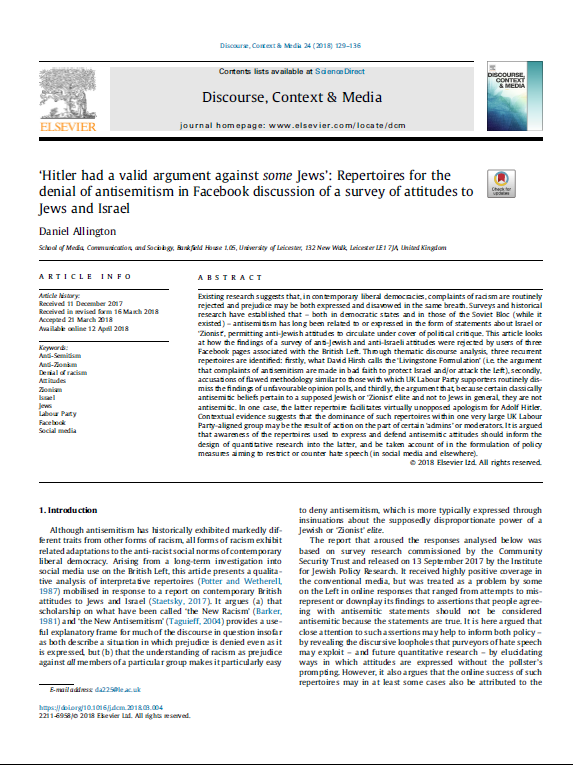 My article ‘ “Hitler had a valid argument against some Jews”: repertoires for the denial of antisemitism in Facebook discussion of a survey of attitudes to Jews and Israel’, which was published online in April this year, has now appeared in the August issue of Discourse, Context & Media. It explains the background to the antisemitism crisis that has now engulfed the Labour Party leadership, then analyses some of the ways in which Labour supporters deny the existence of antisemitism before looking at how the largest unofficial Labour Party Facebook group makes the problem worse by readily expelling those who challenge antisemitism but only expelling antisemites for extreme transgressions. The version of the article that was printed is now the version of record and can also be read online (where it replaces the earlier ‘online first’ version). If you do not have a subscription to Discourse, Context & Media, you can read the accepted manuscript draft on this website or contact me to request a legal copy of the version of record. Allington, D. (2018) ‘ “Hitler had a valid argument against some Jews”: Repertoires for the denial of antisemitism in Facebook discussion of a survey of attitudes to Jews and Israel’. Discourse, Context, and Media 24: 129-136. Existing research suggests that, in contemporary liberal democracies, complaints of racism are routinely rejected and prejudice may be both expressed and disavowed in the same breath. Surveys and historical research have established that – both in democratic states and in those of the Soviet Bloc (while it existed) – antisemitism has long been related to or expressed in the form of statements about Israel or ‘Zionist’, permitting anti-Jewish attitudes to circulate under cover of political critique. This article looks at how the findings of a survey of anti-Jewish and anti-Israeli attitudes were rejected by users of three Facebook pages associated with the British Left. Through thematic discourse analysis, three recurrent repertoires are identified: firstly, what David Hirsh calls the ‘Livingstone Formulation’ (i.e. the argument that complaints of antisemitism are made in bad faith to protect Israel and/or attack the Left), secondly, accusations of flawed methodology similar to those with which UK Labour Party supporters routinely dismiss the findings of unfavourable opinion polls, and thirdly, the argument that, because certain classically antisemitic beliefs pertain to a supposed Jewish or ‘Zionist’ elite and not to Jews in general, they are not antisemitic. In one case, the latter repertoire facilitates virtually unopposed apologism for Adolf Hitler. Contextual evidence suggests that the dominance of such repertoires within one very large UK Labour Party-aligned group may be the result of action on the part of certain ‘admins’ or moderators. It is argued that awareness of the repertoires used to express and defend antisemitic attitudes should inform the design of quantitative research into the latter, and be taken account of in the formulation of policy measures aiming to restrict or counter hate speech (in social media and elsewhere).